In yesterday’s post we learned that food and wine pair up, for better or worse, based on their tastes, flavors, and textures. Today, in installment number two, we Get to Know “The Three Concepts” vital to a perfect pairing. Step two on the path to becoming a food a wine genius: Master the Three Key Concepts…repeat them like a mantra! Key Concept #1: You don’t pair to flavor, you pair to taste. Lots and lots of well-meaning people think they know food and wine pairing because they heard – somewhere in wine and food cliché-land – that you can match or contrast flavors in food and wine. That’s true, you can…but the result is virtually meaningless (and can be a disaster) if you haven’t first dealt with the major taste components in both the food and the wine. It’s worth repeating…the most important component in any food and wine match-up is the taste components…sweet, acid, salt, bitter, oil, and tannin. The presence of any of these in your food will change the way you perceive your wine…for better, or worse! Key Concept #2: You don’t pair to protein, you pair to preparation. If someone tells you they are serving up turkey, fish, or poultry for dinner, your food-and-wine pairing job has just begun. About the only usable information we can get from this tidbit is a hint as to the overall texture of the dish. Otherwise, we have nothing. Let’s face it, protein is bland. Fish, chicken, and pork have almost no taste components in them (save for varying levels of fat and a bit of umami – more on that later) before they are prepared. What do you really need to know before making a match? Hopefully, if you’ve read this far, you know…you want to know what tastes are involved. It all depends on preparation…is it broiled, fried, steamed, and even more importantly…how is it seasoned, served, or sauced? That’s what you need to know! Key Concept #3: You pair to the “The Key Elements” in a dish. To be really, really good at pairing food and wine, you must develop an instinct for discerning the key elements in a food or wine….the tastes, the flavors, and the textures. Most meals are a cacophony of tastes, flavors, and textures, and most wines contain at least two taste components and might carry dozens of flavors. It would take hours to figure out a perfect pairing based on all the information available, even for the simplest meal! So, we have to learn to cut through the clutter and figure out the one or two elements of a wine or a dish that will most impact the pairing. A very good rule of thumb is that is the major taste components (acid, sweet, salt, bitter, oil, or tannin) are present in a discernible level in either the food or the wine, those taste components will be among the key elements. After you have figured out the tastes, try to discern the key flavors. Other components that might be one of your key elements include spiciness, heat as from chili peppers, or an extreme of texture such as the lightness of a lemon soufflé or the heaviness of roast prime rib accompanied by cheddar cheese mashed potatoes. One word of caution in this step is not to rely too heavily on generalities. 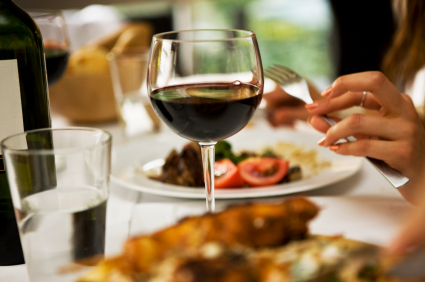 Wine and food are all about creativity and subtlety so take each wine and dish on its own merits. In addition, people vary in the ability to perceive and enjoy all aspects of food and wine, including even the most carefully considered pairings. In other words, if you enjoy it – drink it! Once you develop a knack for breaking a food or wine down into its key elements, and you can learn to apply a few simple rules (see tomorrow’s post) and have a great chance at a great pairing! MAJOR CAVEAT: People vary in the ability to perceive and enjoy tastes, flavors, and textures as well as a range of food and wine (by themselves and in any combination). If it works for you…go for it!